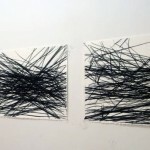 The Walsh Gallery is pleased to present “Linear Thinking,” a group exhibition curated by Jeanne Brasile. Thematically, the show is an exploration of the power and potential of the line. This investigation of a single, privileged formal element demonstrates the various attributions that can be imparted to the line including architectonics, vectors, inter-connectivity, data transmission, scientific and historical studies, and line as pure form. Each of the participating artists has a unique perspective that provides a rich dialogue on a seemingly limited subject. installation, drawing, sculpture and painting. The inclusion of both two and three dimensional work provides another framework through which to interpret the line, inviting viewers to further reconsider the possibilities of visual language and phenomenology. For 150 years, Seton Hall University has been a catalyst for leadership, developing the whole student, mind, heart and spirit. Seton Hall combines the resources of a large university with the personal attention of a small liberal arts college. Its attractive suburban campus is only 14 miles by train, bus or car to New York City, with the wealth of employment, internship, cultural and entertainment opportunities the city offers. Seton Hall is a Catholic university that embraces students of all races and religions, challenging each other to better the world with integrity, compassion and a commitment to serving others. For more information, see www.shu.edu. Seton Hall University is located at 400 S. Orange Avenue, South Orange, New Jersey, 07079. The Walsh Gallery is open 10:30am to 4:30pm Monday through Friday. Next Next post: New e-books for the summer!